I liked to make a big pot of congee whenever I am home alone, it serves as breakfast, lunch and sometimes even dinner!! 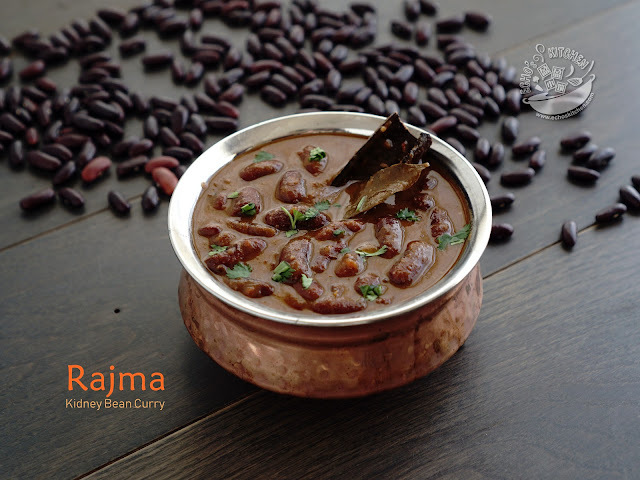 To make it more nutritious, I often add carrot pieces and vegetables, it is very easy to digest and easy to prepare. 1. Clean the chicken pieces, in a deep cooking pot place the chicken, ginger slices, dried scallop, 5-6 cups of water and 1 tbsp of cooking wine if you prefer. Cook at medium low for 35-40 minutes, or until chicken become tender. 2. Dish out the chicken and ginger, throw away the ginger and let the chicken cold down a little before breaking it into smaller size/pieces with hand. 3. 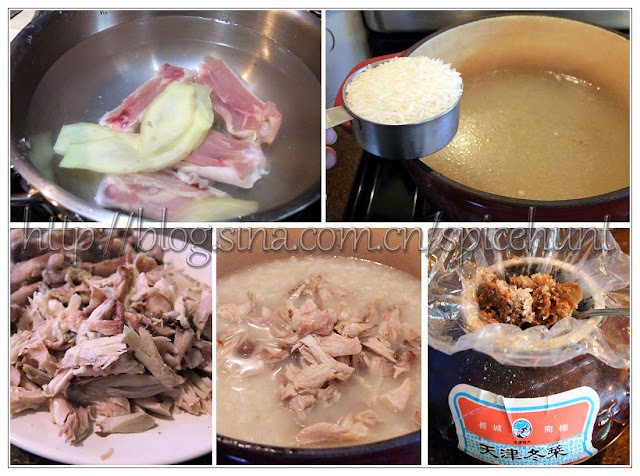 At the same time, clean 1/2 cup of rice and add it to the stock we prepared just now, and cook at medium heat for 30 minutes, or until the porridge/congee become thick. Stir a few times to prevent sticking to bottom. 4. Add the chicken pieces back with Tianjin Preserved vegetable, continue cooking for 5-8 minutes, season with some pepper and sesame oil. Note：Tianjin Preserved vegetable is very salty and I normally do not add any salt after adding the vegetable as the salt content from this vegetable is enough to season the porridge, but if you like to wash the vegetable before use, which will reduce the saltiness of the vegetable, you could add a little salt to the porridge/congee to suit your taste. 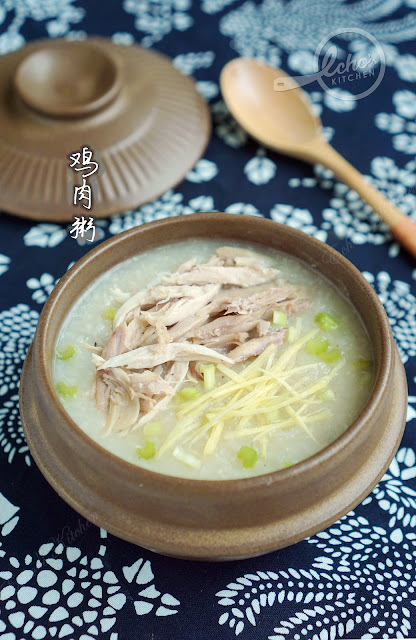 I like to serve it with some Yao Zha Guai (油炸鬼）, a yummy treat! oh wowww.. thanks for letting me know.. I didn't even know that!! 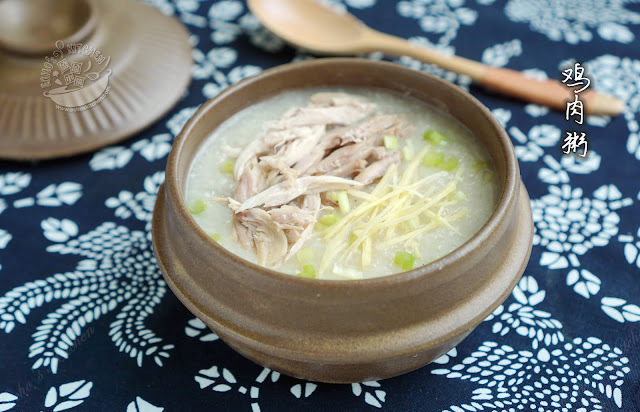 Interesting.. Congee is traditionally eaten with pickles too! !